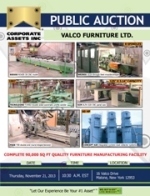 Corporate Assets Inc. | Valco Furniture LTD. - Corporate Assets Inc. COMPLETE WOOD WORKING FACILITY FEATURING: BIESSE (1998) ROVER 30 CNC router; SCM ALFA 32D CNC panel saw; TECNOLEGNO TJ4402 profile sander; BALESTRINI PRAGMA mortiser; WEINIG U22A moulder; PADE T90 round shaper/tenoner; (3) DOUCET S.R.H-30-8.5-180-32 clamp carriers; (3) CONCEPT AIR dust collectors; FCM 75 hp wood chipper; (2) SICOTTE J-3-H borers; BAXTER WHITNEY 29-A planer; (3)TIMESAVER 337 sanders; (5)MATTISON 404 saws; HEIAN tenoner; WADKIN WNT310 tenoner; STENNER EFT3636" saw; TYLER dove-tailer; SCM SANDYA 30 RRT 130 sander; (2) EKSTROM-CARLSON sanders; COMEC LC/15+AV sander; HEESEMAN sander; PROGRESS sander; CAMPBELL 24" planner line; MOODY-L.A.L. paint line; (2)COMPAIR compressors; (3) TCM lpg forklifts; CATERPILLAR loader and much more!